Religion comes as an expression of humankind’s search for a complete picture of the universe. The inherent desire to understand the surrounding, karma, existence and time can be concluded as major reasons behind the formation of religion and attachment to a supreme being. Hinduism is one of the oldest religion in the world and also the third largest. Several kinds of gods and goddesses are worshipped in Hinduism and their number cannot be ascertained. While different forms of deities are worshipped, it is believed that all of the devotees are worshiping one supreme being. 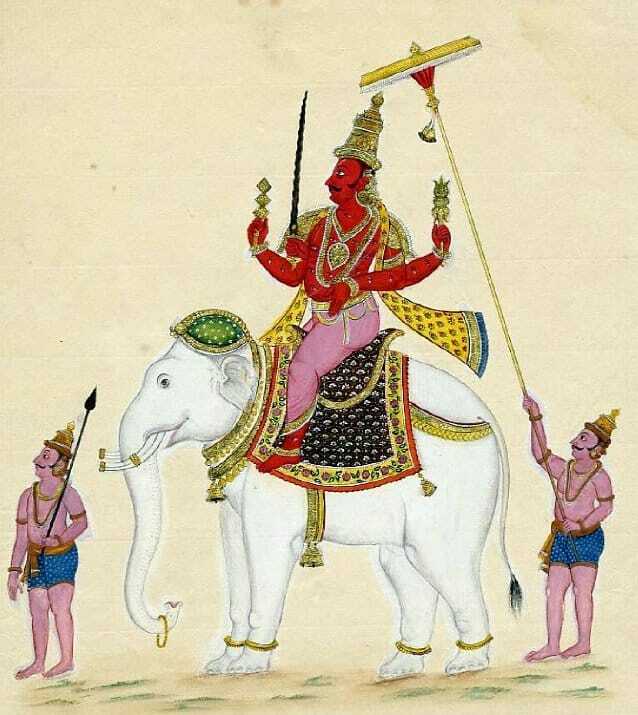 Indra is the king of heaven and the leader of the devas. He is the god of rain. Airavat, an auspicious white elephant is his vehicle or vahan. Another of his vehicle also includes a chariot drawn by ten thousand horses. His weapon is called the vajra. He is the son of Aditi and sage Kashyap. Indra is one of the most important deities in the sky. 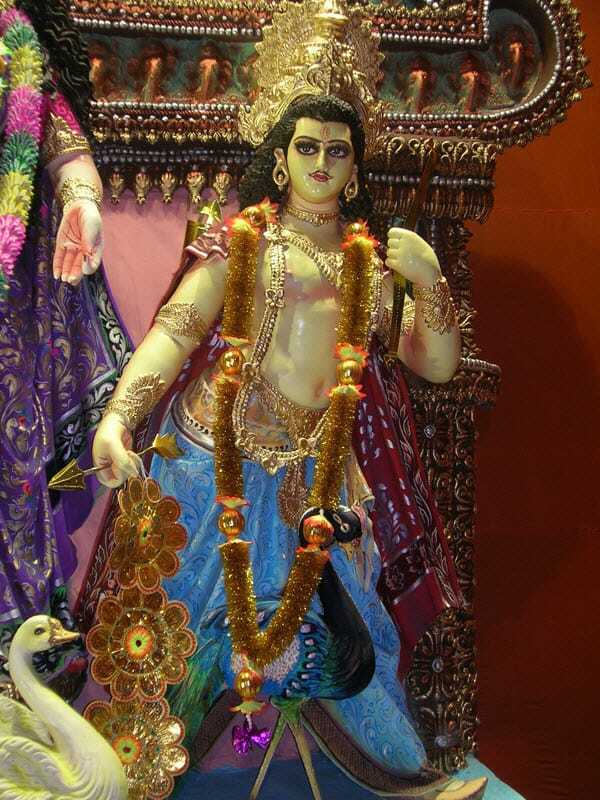 He is often shown as a cunning god, sending obstacles in the way of devotees, especially the asurs with the aim of ruining their efforts of pleasing the gods of heaven. Indra stands for strength and courage. Hanuman, also known as the monkey god, is the son of the air deity, Pawan or Vayu. He is also one among the eight immortals known as astachiranjiwi. 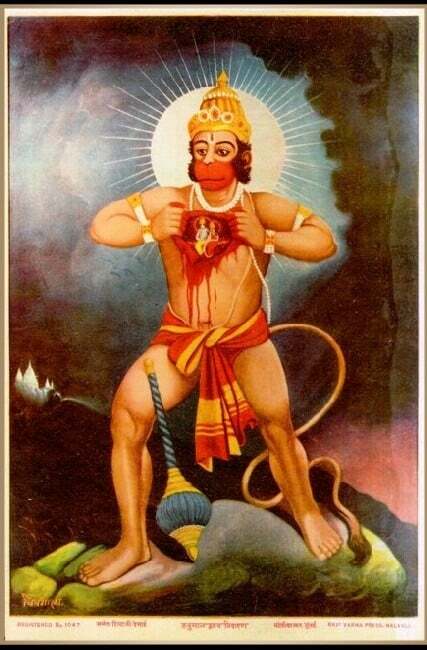 It is believed that, a young Hanuman, once tried to swallow the sun. Due to his mischievous nature, his powers were restricted until his meeting with Ram. After meeting Ram, Hanuman became his faithful devotee playing a central role in the epic Ramayana. He was one of Ram’s strongest alley and devotee, who burned down Lanka (Ravan’s kingdom). Hanuman is famously remembered for saving Ram’s brother Lakshman by carrying an entire mountain of sanjiwani buti, the life saving herb. For all these reasons, he is the symbol of the power of devotion. Harihara is the combined embodiment of two supreme deities of Hinduism. Hari stands for Vishnu and Hara stands for Shiva. Because of this fusion, Harihara is followed by both the followers of Vishnu and Shiva as the form of the supreme god. 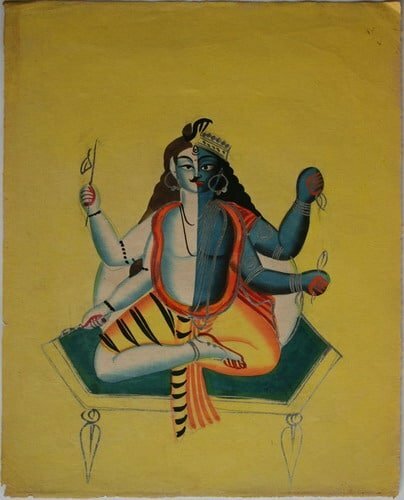 Harihara comes as a representation of Vishnu and Shiva as the one and the same, also showing the equivalence of all gods as the ultimate powers in the universe. The iconography of Harihara is split into two halves. One half represents Shiva holding the trishul, drum and a deer. The other half representing Vishnu has the conch shell and chakra. Kumar is a warrior god of Hinduism. He is also known by the names of Kumar Kartikeya or Kartikeya. He is the first son of Shiva and Parvati. One of the major objectives of his birth was to kill the demon Tarkasur. Because of this he was raised by the Kirtikas, far away from his parents to protect him from Tarkasur’s attempts to kill him. After achieving his powers, Kumar was appointed as the commander in chief of the devas in the battle against Tarkasur. Due to his courage and skill, Kumar was offered to be the king of heaven, but denied as he considered his role as the commander in chief more important and necessary. Peacock is his vehicle/vahan. Krishna, also known by the names of Shri Krishna, Vasudeva, Govinda, Gopal, Madhusudan, is the eighth incarnation of Vishnu and one of the most celebrated philosophers and warriors in Hinduism. He was the son of Basudev and Devaki. He was destined to kill his cruel uncle Kansa, King of Mathura. He was raised by his foster parents Yashoda and Nanda in Gokul to keep him safe from his uncle’s murderous attempts. 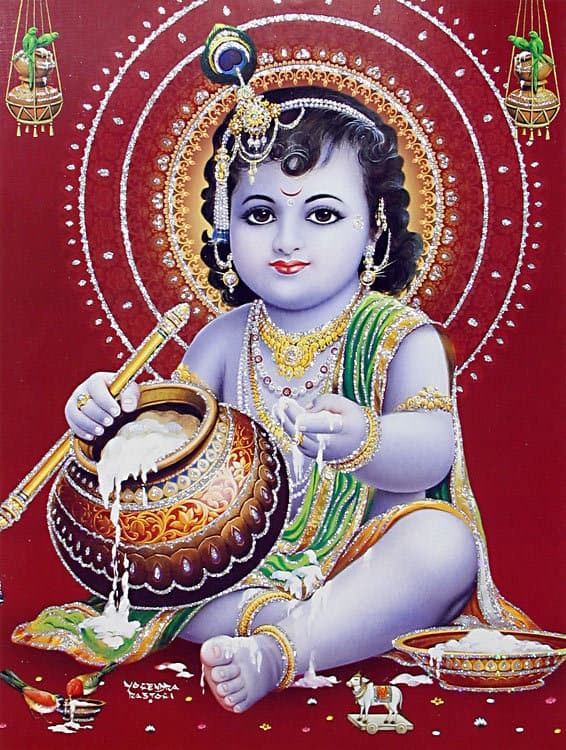 The festival Krishna Janmastami is celebrated to mark his birth. Krishna is also one of the central figures in the epic Mahabharata. In the battle of Kurushetra, he vowed not to use any weapon, but accepted to be Arjuna’s chariot rider. It was during the battle of Kurushetra when Arjuna was faced with a dilemma of fighting against his kinsmen, that Krishna provided him the knowledge of the Gita. Ram, the eldest son of Kaushalya and Dasharatha, ruler of Ayodhya Kingdom, is the seventh incarnation of Vishnu. He is also known as Ramchandra/Rama. The festival of Ram Nawami is celebrated to mark his birth. 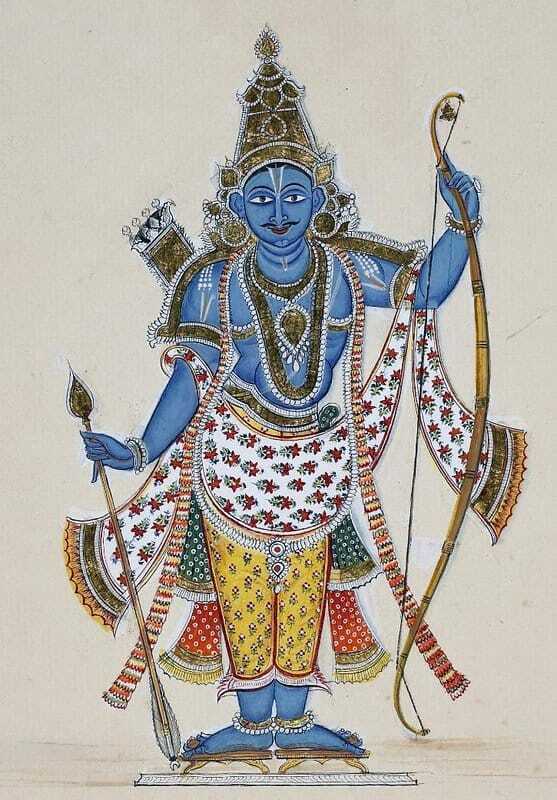 Ram is the central protagonist of the epic Ramayana. Kaikeyi, one of his step mothers wanted him exiled so that her son could be the next King. Ram was accompanied by his wife, Sita, and brother Lakshman during his 14 year long exile. Consumed by evil desires and lust, Ravan, the King of Lanka abducted Sita during their exile. This eventually led up to the war, where Ram defeats Ravan. 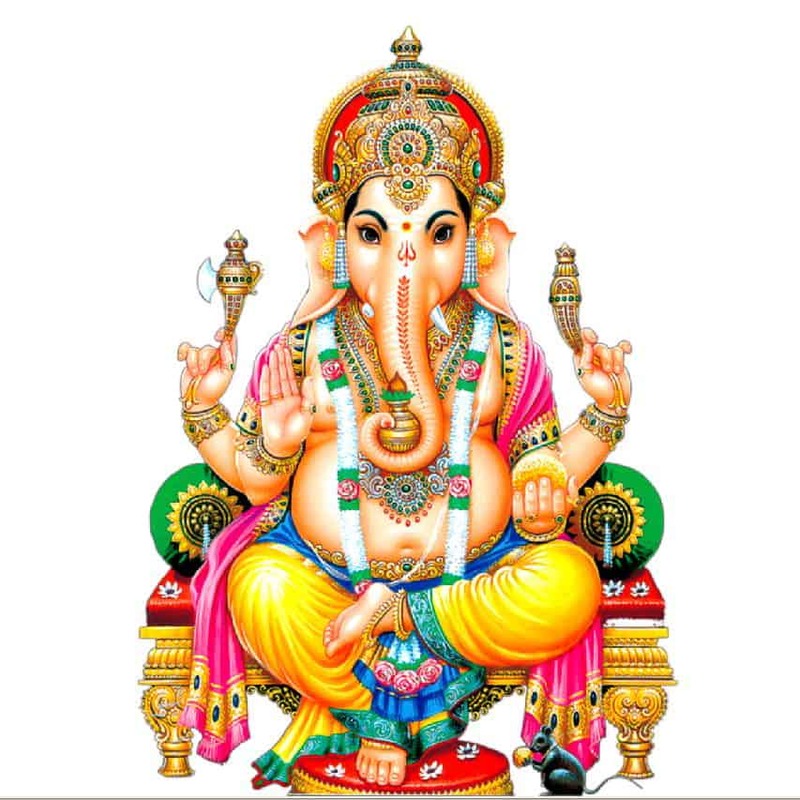 Ganesh, the elephant god is one of the most important deities of Hinduism. He is the second son of Shiva and Parvati and Kumar’s younger brother. While performing any puja or ritual, he is the first god worshipped. During a misunderstood feud where Shiva did not know that Ganesh was his son, he cut off Ganesh’s head in anger. Later after realization, an elephant head was placed and Ganesh was revived, also granting him the power to be the first god in order of importance. Mushak, the mouse is his vehicle/vahan. Ganesh is often associated with good luck or mangal. 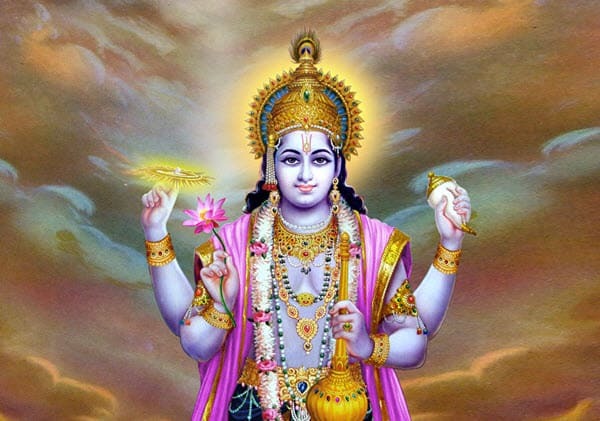 Vishnu, the protector of the universe is one of the trinity gods of Hinduism comprising of Brahma and Mahesh. He is also known by the names of Narayan, Hari. Before the universe was created, Vishnu is believed to have been asleep in a vast sea of nothingness. 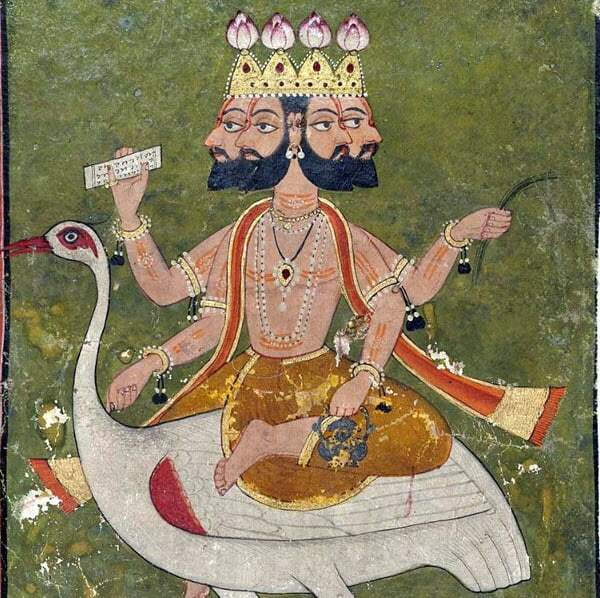 Vishnu is famous for his incarnations known as avatars. Being the protector of the universe, his incarnations are responsible to protect the world from evil powers and prevail peace and order. Vishnu has incarnated nine times. The tenth incarnation, Kalki, is believed to arrive close to the end of the world. Garuda, the mythological bird is his vehicle/vahan. Vishnu resides in Vishnuloka. Mahesh, the destroyer of the universe is also one of the trinity gods of Hinduism. He is also popularly known as Shiva, Ashutosh, Mahadev. He is the only god among the trinity who resides on earth at Kailash. Mahesh is shown as a loving husband, father and a Yogi in his benign forms, while in his ferocious embodiments he is seen as the destroyer, slaying demons and asurs. 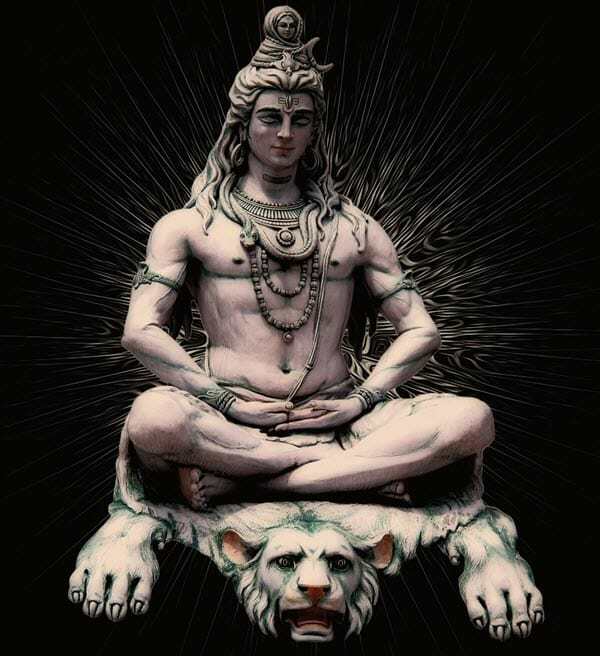 Shiva, also the guardian god of meditation, yoga and arts, is decorated with the sacred river – Ganga and the serene moon – Chandra on his head. He is regarded to be a very simple god worshiped in the form of Lingam. Gods in Hinduism can be analyzed as a set of functional deities, the trinity being the most popular. Each god holds a specific purpose and power. Indra as the rain god, Kumar as the commander in chief, the trinity as the creator, protector and destroyer and others come to verify the functional approach of the role of gods. Depending on the time and place, the popularity of the deities may vary. While the faces and powers may be different, all of them play an important role in the creation, protection, destruction and continuation of the universe. Please don’t just write things. The title was deities who are praised around the world. First of all, everyone doesn’t praise Indra. I dont think even 1% does. No way. Second, Brahma isn’t as popular either, he only have one temple in India. And third and most important, nobody is prayed to as much as Parvati Mata and her 8-9 avatars. Mahakali, sherawali and all others. And don’t forget, even Shani Dev is praised way more than Indra. I know my stuff. I’ve read a lot of Indian mythology. Do let me know if you need any help but don’t post incorrect unverified data.